Vacation Barefoot Travel Blog: Local Vegas peeps - eat w/Wolfgang on the cheap! Local Vegas peeps - eat w/Wolfgang on the cheap! 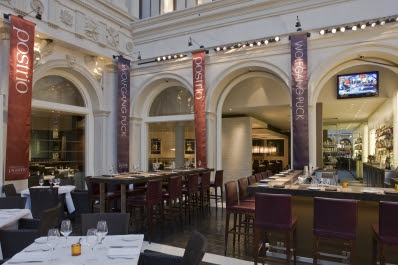 Local Las Vegas residents be aware: You can eat at Wolfgang Puck's restaurant, Postrio Bar & Grill now till September 30th, 2011 for 20% cheaper than what us "tourists" have to pay. The deal applies to food only, so you can't get your drinks cheaper, but it's a pretty cool deal all the same. Postrio was recently updated with a "new interior and exciting new concept and menu" according to their company website. The restaurant reviews well with a killer meatloaf, great pizza, nice fish dishes and good desserts. Check out their lunch menu or dinner menu to see for yourself what you can save on.